PRODUCT DESCRIPTION: Highly acceptable gel bait and easy to dispense delivery system finally provides guaranteed mole control. This bait mimics natural food in taste, smell and texture. The syringe injector system delivers pre-measured doses directly into tunnels. 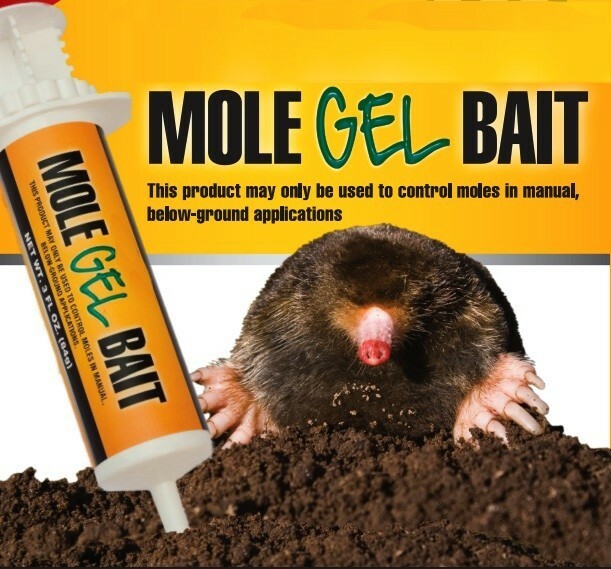 One syringe contains 6 placements which is enough to treat tunnels and burrows networking up to 10,000 sq ft.
TARGET ANIMALS: Eastern Moles, Stamose Moles, Hairy-tailed Moles, Coast Moles, Broad-footed Moles or Townsend Moles. RATE OF APPLICATION: One tube makes six individual bait placements. Bait must be applied directly to active underground tunnel or subsurface runways by making the injection through a small port hole into tunnels that show regular activity.